One of my favorite furiends lives on the other side of the country from me. I have shared with you the story of Lucky, who was abused by an evil human. But because a kind human took him to Homeless Animals Rescue Team, he received the care he needed to recover. Now, he enjoys his life with many fur siblings and his humans. Lucky told me about a feline named Tony, and I will share Tony’s story with you. Tony is only 11 weeks old, furiends. But in those 11 weeks, he has endured a lot. The cage scraped his nose when he was trapped. Tony does not like the scratch this caused. But that is nothing compared to what he has already endured. Poor Tony has burn marks on his paws, which could potentially be a sign of animal abuse. In addition, Tony has a cleft palate, which means he may have to go to the humans in white coats for surgery. His nose is slightly deformed. His jaw was broken at one point, but it has healed. The harm he suffered means he may need dental surgery later. All of this makes Tony a special needs cat. This feline has been through a lot in his eleven weeks, and he needs someone who will take good care of him. Furiends, I can tell you that having a special needs cat like Tony in your home means that whoever adopts him from Anne Arundel County Animal Control will have to pay more attention to him than normal. But keep in mind that there is nothing wrong with Tony’s ability to love and be loved. I hope that someone kind will hear about Tony and adopt this special needs cat. All this kind feline needs is a chance. If you can give him that chance, please contact Anne Arundel Animal Control. And if you cannot, please share his story so that someone can. You know that one of my best furiends is a ginger feline named Lucky. This brave cat survived a horrible case of animal abuse. He recovered from his injuries, and has gone on to thrive and to become a tireless advocate for his fellow felines. Cara is the latest feline that Lucky has helped. You see, Lucky and his humans do a lot of good for the Homeless Animals Rescue Team near where I used to live. An email went to HART, telling them of a three legged feline who was friendly but very skinny. After getting noms from a kind human, it was discovered that Cara is like me and Lucky — a special needs cat. Cara had a leg with a wound and an exposed bone. Not surprisingly given this, her leg needed to be amputated. But this is not the saddest part of Cara’s story. What is really sad is that Cara had been adopted from a shelter, but she was lost for about a month. When Cara’s human was contacted, they said that they could not give her the care she needed. That meant that my fellow special needs cat was going to need help, and that is where HART stepped in. HART found some humans in white coats who could help Cara with the surgery she needed. She will also need treatment for anemia. And she also has some heart problems. The humans in white coats decided to move forward with the surgery before treating the anemia, because Cara’s leg was likely causing her discomfort. And I am proud to say that this tough little girl came through it with no problems. Cara is now resting comfortably and getting medications from the white coated humans to help her recover. And this is all because the kind humans who helped my good furiend Lucky also helped her. Furiends, I do not have to tell you that going to the white coated humans requires many green paper things. Because HART depends on donations to do their good work, it is difficult for them to absorb this. Please help them continue their good work, and send green paper things their way if you can. And if you cannot, please share Cara’s story so that others can help. I am so proud of my fellow special needs cat Lucky, and glad that another special needs cat will be saved because of his work and the work of HART! My good furiend Lucky has not forgotten where he came from. As a former street cat without a human to care for him, he knows how hard it can be for felines on the street. And that is why he is an advocate for other felines. He shared the story of Skye with me, and I wanted to make sure you learned about it. Skye, like Lucky, was living outside without humans to care for her. Some humans found her at a high school, and they took her to the shelter, hoping to be part of a happy cat rescue. This particular shelter had just suffered through a very dangerous outbreak that required all the felines there to be euthanized. In addition to this outbreak, Skye’s age worked against her. She was only around four weeks old, and the shelter did not have the facilities to care for a tiny feline like her around the clock. Fortunately for both the humans who wanted to help Skye as well as this tiny feline, another kind human was in the right spot to make sure everyone got what they wanted. She knew she could not keep Skye herself, but she contacted another human who could help. Eventually, Skye found herself joining Lucky as another feline helped by Homeless Animals Rescue Team. She is still recovering from her time outside where she didn’t get the care she needed. But she is with a cat rescue group that will work very hard to make sure she has the chance to thrive. 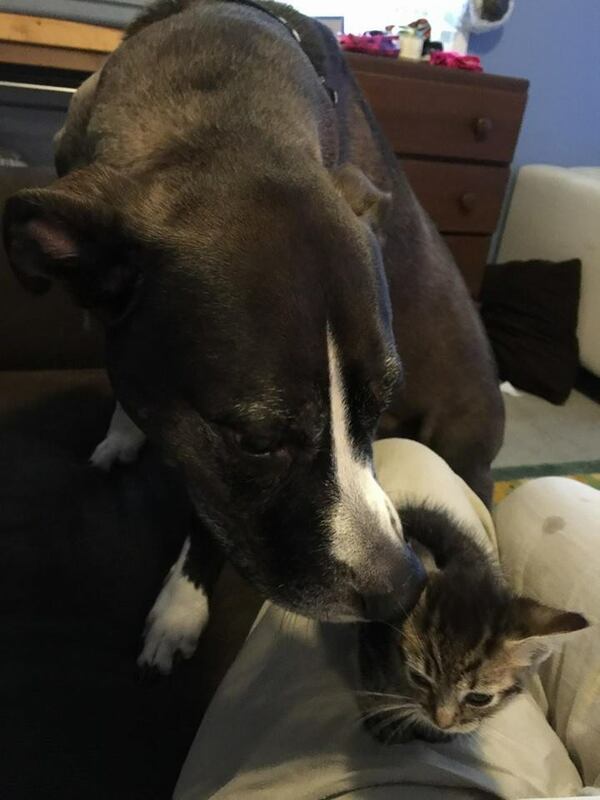 She even found through this cat rescue group a canine furiend to snuggle with. That is a good outcome for a tiny feline who was close to being euthanized!